Banksy is an enigma, a cult, a marketing wizard, and a curious blend of street smart revolutionary and cutting-edge artist. He’s also anonymous, well protected, and a fascinating topic for a written portrait. This review looks at a relatively recent work (2012) that attempts to draw as complete a portrait as possible. With Banksy: The man behind the wall, Ellsworth-Jones brings us his own journey into finding out who this Banksy fella is. And in fact, this is why this book is a portrait, carved from one man’s perspective, and one man’s point of view. It is a far cry from being a biography, however far biographies can pushed under the banner of ‘unofficial’. It reminds me, in fact, of all of those Unauthorised videos and albums that abounded in the 1990s: They weren’t official, they were never authorised (which in this case is actually a big deal), but they were no less satisfying for all that. Banksy: The man behind the wall (hereafter referred to as just Banksy) is one of the best doorways by which to view the infamous artist for those who have not been a fan since the early days. So if, like me, you love Banksy’s work but are seriously still just a fringe-dwelling-internet-gazer, grab this book and devour it. And devour it, you will. I saw this book, like many of the books that I just spontaneously buy without thinking, in the front window of Clarity Records. And I bought it without looking at the price tag. It goes something like this: Spy book – walk in – grab out of window – pay – wince. And however much the price makes me wince afterwards, every book I’ve ever bought in this manner from this particular store has proved to be paydirt. Every. Goddamned. Time. Will Ellsworth-Jones has a laid-back, casual style about him. In fact, it’s so laid-back that I was surprised on more than one occasion by the demonstrated depth of knowledge that he has about the art work (and, indeed, art in general). It’s so relaxed that it’s almost like reading a diary of his journey into this mad world that Banksy has created. The deeper it goes, the madder it gets. In a sense, this book wouldn’t have worked in any other way. It’s a reflection of the pilgrimage that many Banksy fans make when they decide that they want to collect works by Banksy. They start to realise that authenticating works is difficult, that selling them is difficult, that dealing with the interface between street art and galleries is difficult. And much of the webbing in between has been established by Banksy in a bid to remain mysterious, anonymous, and untouchable yet valid. The validity of anonymity is something that this author addresses with remarkable astuteness. It is, in fact, an incredible thing, to be completely anonymous, to have legal requirements actually stitched up to the point where people will not discuss events for fear of being in breach of a contract – even with municipal councils. People respect, guard, and defend this artist because of his anonymity, in a world in which we are all splashed everywhere and want to be seen. It’s enough make you stop and think. If someone can be famous and unknown, why is everyone trying to be famous and known? It’s an interesting philosophical discussion, and probably best kept for another time. This work, Banksy, takes you through the early days of Banksy’s life, right through to how his celebrity occurred, the unease of street art versus what I’ll call bourgeois art, the uneasy way that money and doing good sits together. It includes portraits, commentary, and illuminating information about the people that have been (and are) involved along the way. The work concludes with a proposition that perhaps from this point onwards, Banksy’s controls might backfire, because he actually is not a revolutionary. That perhaps he never was. That perhaps it’s all just good marketing. If you’re a fan of Banksy, I highly recommend you read it. And if you’re not a fan of Banksy, I highly recommend you read it. If nothing else, you’ll learn a whole lot about graffiti art that you never knew before. 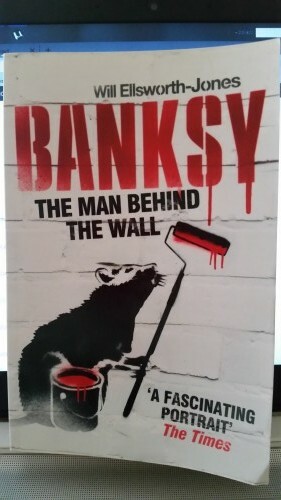 Banksy: The man behind the wall is published by Aurum Press. You can get it at Clarity but I’m sure you can get it just about everywhere else too.